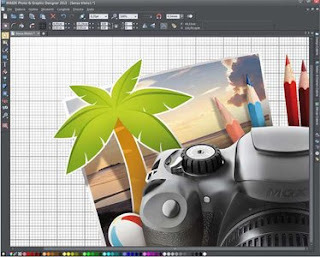 SAGITA COM - MAGIX Photo & Graphic Designer 2013 adalah Solusi lengkap untuk editing gambar dan desain grafis. Solusi terbaik untuk mengedit foto dan grafis digabungkan menjadi satu antarmuka. MAGIX Photo & Graphic Designer 2013 Bekerja dengan berbagai fitur inovatif secara real-time oleh kinerja yang kuat. Proses foto sempurna dalam beberapa langkah Cutting, kecerahan, kontras, suhu warna, saturasi, dan ketajaman, Mengoptimalkan foto Anda hanya dalam beberapa klik. Koreksi dapat otomatis atau manual. Fast optimization or retouching detailed, it is quite possible! Save time by processing multiple images at the same time. Optimize the size of your projects with the tool for reducing the file size and resolution. Process different projects as a single program. development of graphics and photo editing. The possibilities of export are multiple image files, graphics for the web or PDF file for printing. Centralized control, which means that you will have to learn how to use one tool instead of many small programs for photo editing and graphics. Projects can be simply transferred to other MAGIX programs for a more detailed elaboration. This way you can continue to develop your own creations. Graphics Card: Onboard graphics card with a screen resolution of min. 1024 x 768. Hard disk space: 1 GB free disk space for program installation. Optical Drive: CD / DVD drive (for installation only for version with shipping). Windows 8 (32 e 64 bit), Windows ® 7 (32 64 bit), Windows ® Vista ® (32 64 bit), Windows ® XP (32 bit). keren softwarenya, full version lagi! Sama-sama kak n salam balik dari gita. Mba Bro Bisa Request g ? magic bullet for pinnacle 14....thx !! !